On stage during a recital, audiences see the result of months of hard work. They watch in awe as your students dance gracefully and perfectly hit their choreography – hopefully. But what they don’t see is all the choreographed backstage management going on behind the scenes. As any dance teacher knows, managing your dancers backstage can be rather stressful. With nervous kids – and teachers – costume mishaps and other various issues, keeping kids in line and focused can be a real headache. Follow these tips for better backstage management at your studio’s next recital. With your dancers performing multiple routines for one recital, they’ll need to be pros at quickly changing in and out of their costumes, along with any makeup or hair alterations. In reality, though, this isn’t always the case. To help them become better at changing quickly, have them practice switching costumes at the studio. So grab a stopwatch and time your dancers in the weeks leading up to the recital – the extra effort is worth it to save you and your dancers stress come performance time. 2. Repeat After Me: Stay in Your Designated Area! Young kids have trouble staying put in general – add pre-performance anxiety to the mix, and you’ve got yourself some antsy dancers. Your students might also want to wander off to the audience area to chat with friends, or sneak down to the vending machine for a snack. Big no-nos. It’s important that your dancers stay put backstage. As Dance Advantage noted, you have a lot to manage and keep track of during the performance, and students wandering off means that they might miss their entrances or interrupt someone else’s, along with being a safety issue. So, pre-performance, drill into your students’ heads: stay in place! There’s way to much going backstage for only you to be in charge, so you need to assemble a super team. Gather volunteers or other teachers and assign specific roles to them for the most seamless operation. Carol Zee, artistic director of The Gabriella Foundation, told dance Studio Life that she assigns the following jobs: stage manager, on-deck supervisor, quick-change supervisor, stage left headset, stage right headset and dressing room monitors. Tips for a Backstage Bravo! Studio owner with young kids. Studio owner with kids in other activities. Before I had children, my studio centered on the needs of the classes. Whatever worked best for the classes took first place. If we needed an extra rehearsal and the only time to do it was 9:30 p.m. on a Wednesday night, by golly, we got it done. Then I had my first of five kids and my focus became survival. Whatever it took to survive, that’s what I did. Classes with coffee? Yes. Email at 2 a.m.? I was up anyway. It was all about just keeping things going. Then my children became involved in their own activities and I got a new perspective on the studio—that of the parent who wanted to do everything they could to support their child, but didn’t know how. I was the soccer parent who didn’t know about the goalie camp. I was the snowboard mom who didn’t buy the right equipment. And, worse of all, I was the dance team mom who was late to a performance because I didn’t know the arrival protocol. Once I became an “activity mom,” I vowed to make it easier for our studio parents to understand dance training, progress and policy by offering parent-teacher conferences. These annual one-on-one meetings for dancers in our Graded Technique program (4th grade and up) have become a huge hit. Want to know more about the wonders parent teacher conference for dancers have had for students, parents and teachers alike? Keep reading for 5 Ways Parent-Teacher Conferences Changed My Studio. What Should Your Dance Studio Policies Be? Well-developed studio policies are essential to keeping your dance studio running smoothly. Not only that, they also help keep your sanity intact! If your policies are poorly drawn up, or don’t cover what they need to, then your classes will be disorganized and inefficient, dealing with parent and student issues will be a headache and you may not even receive the tuition payments that you deserve. Strong, clear-cut studio policies are the gears that make the dance studio machine turn. However, creating policies is not as simple as just jotting a few basic rules down. Read on to learn how you can create the best policies for your business. Suzanne Blake Gerety of DanceStudioOwner.com told listeners in a recent webinar that studio policies are the terms of a business transaction. Keep this thought at the forefront of your mind when creating your rules. “When someone becomes a student, it’s easy for us to get caught in the warm welcome, without realizing that you’re doing a business exchange: tuition for education,” said one of the hosts. You can’t continue to operate your dance studio and share your passion with students if you can’t make a profit. While emphasizing payment requirements may seem uncouth or harsh, it’s absolutely necessary to make sure they’re clearly communicated in your policies. Your time and expertise is valuable, so don’t be afraid to strongly express payment requirements – and stick with them. If a parent has an issue with tuition or other financial expectations, you can then point to the policies that were agreed upon ahead of time. Another factor to keep in mind when drafting your dance studio’s policies is that, like it or not, people have short attention spans in this digital age. That doesn’t mean you should skimp on creating comprehensive policies or leave things out, however, it’s worth it to think about how you can most effectively communicate your policies. Parents deal with demanding schedules and a million different responsibilities, not to mention how they have many forms to sign and disclaimers to read over for their children on a daily basis. “They have messages coming at them from 8 million different directions and it’s getting more and more challenging to deliver and get the message into their hand, not only get it to them, but make them clearly understand it,” said one of the webinar hosts. Keep policies clear and concise, and use images wherever you can to dynamically convey information. Bullet point lists break up longer blocks of content so parents can digest it more quickly. Put the most important information at the top, and bold, use color font, use all capital letters – or do all three – to make important deadlines stick out, or otherwise they will be missed. Also, post your policies in as many places as possible, so it’s easily accessible and never more than a few clicks away. Upload them on your website and email them to parents, and make sure you’re constantly regularly reminding students and parents about them. Making sure your policies are followed ensures that you can provide the best dance education and experience for your students. Almost every dance studio owner has dealt with some problem parents at one point or another. Sometimes you might not see them coming, other times you can tell they’ll be difficult from a mile away. However it occurs, one bad apple tends to spoil the rest. You don’t want to let one parent turn all of the other parents against you, or encourage them to engage in the drama. So what is a dance studio owner to do? Consider these four tips on how to deal with troublesome dance parents and how to avoid welcoming them back for another year. It is important for dance studio owners to have a contract that lays out the studio policies as well as the consequences for breaking those rules. All parents, and children if they’re of age, should sign this contract before enrolling. If a parent violates one of these rules, studio owners should document the incident and notify the parent. * Refer to your list of studio policies that the parent agreed to upon enrolling in your studio. Most studio rules don’t welcome aggressive or negative behavior, regardless of whether it comes from the student or parent. It’s also important not to bring other dance parents into the mix. While they may agree with you, you don’t want to start drama between dance parents. However, it is OK to corroborate your opinion with other studio staff members to help support your stance. Sometimes parents will cause a scene during the dance year, forget about it over the following summer, and assume they can come back and have a fresh start. However, you and other parents may not have forgotten about that incident. While you might be surprised by their attempts at re-entry, it does happen. If studio owners don’t handle bad behavior right away, it could have unexpected consequences—other parents may be dismayed that a parent got away with poor behavior and choose to leave the studio. When these scenarios occur, it is vitally important to deal with them in a timely fashion. Some dance studios offer feedback forms, according to DanceAdvantage.net. These forms give parents the opportunity to mention any comments, good or bad, that they have about the studio. Sure, the commentary may not always be constructive, especially if they bring up something like a costume malfunction, but these forms can also help keep the peace and prevent gossip from stirring up. Once these forms are submitted, dance owners and parents can sit down to discuss the issues at hand. Setting up a meeting can be a calm, constructive way to find a resolution for a problem. Sometimes, though, resolutions cannot be found. At this point, you’re allowed to note that it’s studio policy and can calmly suggest that they find another studio to go to. Even though it isn’t the best way to refuse a parent back, you can do so knowing that you tried your best to hear the parent’s point of view. Tardiness shouldn’t be welcomed at practice or any other time, as it can quickly become a habit. Dancers who show up late may throw off routines, cause practices to go later or could compromise a dance recital. As a studio owner, it’s important to discuss your rules about tardiness with parents. Note the issues that arise from tardiness, and its effects on other dancers and parents. The same goes for payments. To keep your business up and running, you need to charge parents for their children’s lessons. Whether you charge them weekly, monthly or bi-annually is up to you. However, if a parent doesn’t pay, it can quickly become an issue. If a parent consistently forgets or owes the studio a significant amount of money, it’s acceptable to terminate his or her contract. Discuss with the parent how lack of payment affects the studio as well as the purchase of costumes, footwear and equipment. Hopefully the parent will understand these legitimate reasons for not being welcomed back. *Reader and veteran studio owner Danie Beck also suggested that in some cases, after you’ve spoken with the parent it may be a good idea to put the dismissal and the reasoning behind it in writing and send it to the parent. If you do, she noted that you should be sure to send it to them “return receipt requested,” so everyone is on the same page and there won’t be any surprises at registration time. Editor’s note: This article has been updated to include reader feedback. You may think that you know what you’re getting into when you decide to open a dance studio. After all, you’ve likely been involved in the industry for a good part of your life. However, there are definitely some tough lessons you’ll learn when you enter the business side of the dance world. Here are 8 things you’ll come to understand throughout your time as a dance studio owner. As a new business owner, you’ll likely want to say yes to everything. It’s hard to tell people no, especially when you are just starting to build relationships with your customers. However, make sure you balance the needs of your students and parents with the needs of the studio. It’s a delicate scale, and you’ll occasionally have to use “no” to keep the balance in check. You probably have goals, plans and aspirations for your studio, and that’s great! But you should really be putting them in writing, otherwise they’re easy to forget or lose sight of. This is where an actionable business plan comes in handy – write a detailed roadmap before you open your studio and make sure to update it every year. You may have the dance skills, but do you have the business savvy? Your pirouettes and plies will come in handy when you’re teaching young dancers, but they’re not going to help you much when it comes time to pay taxes, send invoices or market your studio. Small business owners of all sorts need to have some business-savvy if they’re going to excel, so you may need to purchase a how-to book or sign up for a seminar to fill out your skill set. No two mama dramas are alike, and you’ll be faced with a host of problems throughout your time as a studio owner. It’s important to figure out how you’ll deal with problem parents, diva students and other issues that affect the atmosphere at your school. Your customer service can make or break your studio, so be sure to give it the attention it deserves. Because you’re serving as a teacher, marketer, book keeper, administrator and more, there will be days when you’re exhausted and overwhelmed. This is when you need your support system more than ever. Whether it’s your spouse, friend, partner, child or fellow teacher, you should have someone who’s there to lend a hand on your toughest days. If you go at it alone, chances are that you’ll wind up with more gray hair than you bargained for. It’s human nature to want people to like you, but very few business owners go through their careers without stepping on a few toes. Sometimes you’ll have to say “no” – as mentioned in No. 1 – and this can lead to upset parents, dejected dancers or disgruntled teachers. Do your best to mend the relationship when this happens, and continue on your way. Running a business isn’t all fun and games, but that doesn’t mean it has to be unenjoyable. The reality of the business world is that only 50 percent of companies survive for five years and just 30 percent last 10 years or more. If you’re in this for the long haul, you need to keep in mind that you’re running a business! Each decision you make should be beneficial to the studio if you want to make it in the competitive world of dance. You know the happiness that fills you up when you do something you love? Well you’ll probably get to feel that way every day you’re in the studio. Teaching people to dance is amazingly rewarding, and you’ll find that even on your longest days, you have a smile on your face. What would your studio be without your awesome dance instructors? They’re the ones working with students, helping put together recital pieces and fending parent questions. In many dance schools, instructors are an integral part of the business. However, being a dance teacher isn’t all tutus and glitter. There are times when your instructors will be stressed and frustrated, and it’s in your best interest to help alleviate some of their problems to make their lives a little easier. Here are five common problems that studio owners can solve for the sake of their teachers. You may not realize it, but if your studio has lax or unclear policies, it can end up affecting your teachers. On a Dance.net forum, a few instructors explained that when their studios do a poor job of communicating with parents, setting up dress codes or explaining expected class behaviors, it makes their lives a lot harder. Setting up set policies for your school is a quick fix to this issues, and it not only will benefit your teachers, but it will likely help out you and your business as a whole. Your teachers likely love their charges, but that doesn’t mean they want to hang out with students for 20 minutes after class ends. Instructors have lives too, and many times, they’ll have places they need to be. It’s your job as the studio owner to enforce your pickup and dropoff times so that no one has to be babysitting after class is over. Mama drama is inevitable sometimes, and you should be there to help your instructors deal with unhappy parents. Establish clear guidelines for parent complaints and make sure you’re involved in the resolution process. It will take a whole lot of stress off the shoulders of your teachers. Parents love to watch their little dancers perform, but it’s often distracting for the class and the instructor. Find a way to minimize distractions that come along with parent observation, whether it’s by setting up limited class time when parents can watch or installing a one-way mirror or TV monitoring system. There may be times when you really need a teacher to stay after hours with a student or to help set up for a recital. However, it’s important that you realize what tasks aren’t in the usual scope of a dance instructor’s job description and offer additional compensation if necessary. Many studio owners have experienced the following situation: Your school is doing great. Enrollment is through the roof, and just when you think it’s smooth sailing for the next few seasons, you see the sign. A new studio is opening up right down the street, and even worse, they’re offering the same classes! All of a sudden your prospective students have another viable option to choose from, so how do you ensure that your school continues to thrive? In the world of running a dance studio, studios need to stay vigilant if they want to succeed in a sometimes crowded field. Here are four steps that will help you keep your school’s doors open, regardless of how saturated your market becomes. Your first instinct when you find out there’s a competitor opening nearby is to shift your attention to learning everything you can about the new business. After all, it’s upsetting when someone thinks they can one-up your studio! However, you shouldn’t obsess about this new establishment. Instead you should start obsessing about your own. Blake explained that studio owners need to stay focused if they want to get ahead of the competition. If you’ve been slacking on marketing or facility upkeep, use this as the kick in the pants you need. Crunch some numbers – what’s the return on investment for your different marketing strategies? What’s your customer acquisition cost? Focus on the nitty gritty aspects of running a dance studio, and you’ll be equipped to compete in a saturated market. If your new neighbor is offering the same classes as you, it’s essential to figure out what makes your studio unique. Maybe, like Blake mentioned, it’s your school’s culture and atmosphere. Or perhaps you have more experienced teachers. Sit down and think hard about what your niche is and why it makes your school a great place for dancers to learn. Coming up short? If you’re floundering to find your differentiating factor, you may want to consider revisiting your business plan. Your previous success may have been based on your lack of competition, but now that there’s a new sheriff in town, you need to reevaluate your business model and figure out what you can do to make your studio competitive. Once you’ve figured out exactly what it is that makes your studio unique, take that aspect and run with it. You’ll need to thoroughly differentiate your marketing from your competitors to ensure that potential students know exactly why your school is the place to dance. Revamp your website and social media sites. Update your fliers with a new emphasis on your sweet spot. Design new ads and do research into effective marketing tactics you may be neglecting. Your goal should be to reach students in new ways and convince them that your school is the best option in town. In the midst of all this marketing mayhem, it’s easy to overlook the needs of your current clientele. However, Marketing Donut explained that if you want to stay ahead of the competition, you’d do well to cater to your patrons like never before. Improve your customer service, orchestrate an amazing recital or poll your dancers to see what changes they’d like made. Paying ample attention to your existing students will ensure that they re-enroll for next season and that you’re not losing business to your competitors. What Are Dance Teacher Responsibilities? Are you hiring new teachers for your studio? Or, revisiting your teacher contracts? If so, you’re probably considering what to expect from your employees. After all, it’s seldom that dance teachers are required to simply show up and teach class – there’s so much more to the role! Having clear expectations for teachers makes for a successful school. 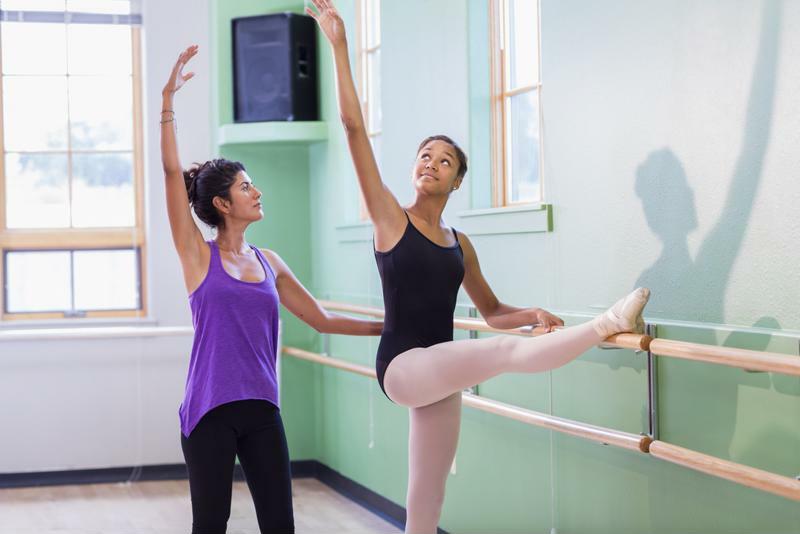 Consider these points when laying out dance teacher responsibilities at your studio. There are a number of “givens” that you can expect from any employees working in your studio. These include showing up on time, behaving professionally, being prepared and respectful, and successfully teaching the students. However, there are also a number of supplementary responsibilities that you may also want to outline in a teacher’s contract. The UNITY Dance Organizations explained that dance educators should always provide a safe environment for their students, both physically and emotionally. Additionally, it is important that they serve as role models for dancers in terms of sportsmanship, lifestyle choices and attitude. There are a number of dance teacher responsibilities outside the classroom. On a daily basis, teachers should be respectful and supportive of other staff members and as open as possible regarding studio matters. Many studios expect their instructors to become familiar with the parents of their students and help to enforce policies on dress code and behavior. These are pretty standard tasks that you do not need to offer additional compensation for. However, be sure to clearly outline these responsibilities in your employment contracts so teachers know what is expected of them. Outside of these standard responsibilities, there are instances where you may have to offer additional compensation to your instructors. DanceStudioOwner.com explained that many studios pay their teachers extra to attend certain yearly events, such as open houses, competitions and auditions. Similarly, extra tasks like choreographing routines and conducting private lessons should be compensated accordingly. You’ll want to outline your policies and rates for these tasks before hiring new teachers. This way everyone will be on the same page as to what is part of the job description and what is considered extra work. Dance Studio Policies: Should You Have a Social Media Policy? Social media sites – especially Facebook – are useful tools for dance studios, as they can aid in marketing and communication with students. However, there have also been many instances where teenagers and sometimes parents abuse the sites, using them to hurt other people or businesses. Because of the potential harm that can be done on Facebook and other social platforms, many studio owners choose to create social media policies for their businesses. These guidelines can be beneficial, but there are a few considerations to take into account when creating dance studio policies that regulate social media use. The first factor that you’ll want to take into account is who will be authorized to post news and announcements on behalf of the studio. Sometimes businesses can get into sticky situations when instructors post unauthorized information on their personal pages regarding the studio. Dance Teacher magazine recommended that you establish expectations that all student and parent communications occur through the main studio page. If teachers have something they want to share, have them forward you the information before posting it live. This way you’ll be able to monitor and approve all posts. One of the benefits of social media is that your followers can chime into conversations with their own thoughts and ideas. This is a great way to get students and their parents engaged with the studio, but sometimes people will post mean or derogatory comments on a public page. To address this issue, you’ll want to explain to students your expectations for posts on the studio main page. Any remarks, photos or videos should be appropriate and reflect well on the studio. Be sure to explain that you reserve the right to delete any harmful or unnecessary comments. While you can control what third-parties are posting on your studio’s social media pages, it’s important to realize that what gets said on private accounts is a different matter altogether. Some studios include stipulations in their dance studio policies that bar students from defaming the school on their personal social media accounts. However, Dance Studio Life explained that there have been lawsuits filed to keep businesses from enforcing these types of regulations, as they are often construed as limiting freedom of speech. Be careful how you word expectations about posts on personal accounts. It’s generally best to phrase these rules as suggestions instead of hard policies. At the studio, the dance experience can be enriched when parents bring the experience full circle with a post-class conversation. The conversation can be based around one or multiple questions listed below. Asking dance questions will enhance the familial experience, and dancers will undoubtedly appreciate their parents’ interest and involvement in their activity and extracurricular. Tell me about a move you learned today. Do you think you could teach it to me? Did you learn a new vocabulary word in class today? Did you make a new friend in class today? Were you kind to someone at dance today? Do you think we could stretch together tonight? What is some of your favorite music you hear in dance class? Did you do something particularly well today? Did you struggle with a skill today? Of course, children also love invitations to show their moves, create choreography, and produce mini shows. Encourage these opportunities, and involve yourself with your dancers’ love for their art! There will be times in your career when parents don’t always agree with your choices or teaching methods. Even as an adult, it’s hard to deal with criticism from other people, especially when it’s said behind your back. If parents are unhappy during or after dance competitions, chances are that they will talk about it in the studio waiting room or even on social media. These instances can be hard to handle, so use these tips for dance competitions to make the most of an uncomfortable situation. The first step toward dispelling negativity during or after competitions is to set up clear expectations for students, parents and teachers. DanceStudioOwner.com recommended that you explain to everyone that it’s necessary to stay professional and keep a positive attitude in person and on social media. No matter how well students perform, the experience shouldn’t be all about winning, but rather learning and having fun. It may also be helpful to explain to parents that their words and behavior have a significant impact on dancers. Many young athletes, dancers included, will eventually give up competitive sports because they feel as though they’re under a lot of pressure to perform and the game is no longer fun. Encourage parents to do everything they can to make competitions fun for their children and alleviate the pressure to win. One of the best things you can do to flesh out any discontent or complaints about competitions is to promote dialogue between parents and staff. If you notice that parents are only expressing their concerns to each other, it might be a good idea to host a town-hall style meeting or one-on-one conferences to get these thoughts out in the open. However, keep in mind that if you want parents to feel comfortable voicing their concerns and complaints to you, it’s essential to remain empathetic, understanding and professional. Chances are that parent grievances are not an attack on you as a business owner, even though they may initially come off that way. While you can’t control what parents and students post on their own social media accounts, you can ask them to remain respectful and positive while posting on or about your studio’s page. Many studios choose to create a social media policy that outlines what content they encourage and what type of comments will be removed. For example, the New Zealand School of Dance states in its policy that they “welcome feedback, comments, reviews and ideas from all followers” but request that these contributions are respectful and appropriate for all viewers. In dance studios, there’s a method to the madness of dress codes! Besides requirements for appropriate attire, the dance studio dress code is designed to help students perform better and see themselves as a cohesive unit. As your students get older, there’s always the chance that they’ll take some liberties with the dance studio dress code. It’s something that every instructor faces at some point, and how you handle the first few instances is crucial. Use these tips to ensure that your dancers stay in dress code and accept the rules of the studio. At the beginning of each season, you should have your dancers sign a contract stating that they understand what constitutes appropriate attire in the studio and agree to abide by your rules. This isn’t as essential with younger students, but it’s a must-have for pre-teens. By making your expectations clear from day one, you’ll put yourself in a better position to enforce the dress code. When you have a student’s signature on a contract, it’s much easier to mitigate any rebellion. Remember when you were a teen yourself and your parents used to tell you to do things “because they said so”? That phrase is especially frustrating for young adults, so don’t use it as a reason your studio has a dress code. Explain to your dancers why it’s important for them to wear specific clothing. When students are dressed alike, it’s easier for a teacher to spot someone out of form or behind the count. Dancers wear their hair pulled back so they have a full range of sight while performing. There are logical reasons behind your dress code, so let the students know them! A scheduled dress-down day is a great way to reward your students for their hard work and keep them from breaking your dress code. It gives them the opportunity to wear the cute new leotards they’ve been dying to show off and express a little bit of their personality. However, make these days a reward, not a given. If too many students come to class dressed inappropriately, you might want to postpone the dress-down day until they abide by the rules. Dancewear can get pricey, so it’s important to keep budget in mind when setting a dress code. Choose practical, long-lasting products that will last for a number of years. This way your students won’t need to replace their uniform each season and parents can save some money. If your dance studio dress code is out of some dancers’ price range, it could lead to attire issues. Another good option is to sell products in your studio so dancers can quickly and easily replace items that wear out. Right next to the often stereotyped “pushy dance moms” are the hovering parents. They’re harder to handle than disagreeable parents because they aren’t really doing anything wrong. However, students will often be nervous or intimidated if they know their parents (or someone else’s) are watching from the doorway. Here are a few tips for dealing with helicopter parents without stepping on anyone’s toes. Many hovering parents are driven by the fear that in a large class, the needs of their child will be overlooked. You can’t blame parents for worrying, and the best way to ameliorate these concerns is to show that you can handle whatever crises arise. A blogger on Washington Parent said that he was taken aback when the dance teacher banned parents from the studio on the first day of class. The dancers were only 3 years old, and he had planned to hover to make sure his daughter wasn’t scared or nervous. However, the teacher immediately took charge, got the class in order and proved to parents there was nothing to worry about. The students, as young as they were, were given their first taste of independence and it helped to build their confidence. If parents see their children are in capable hands, it will help them to stop worrying and hopefully stop hovering. Another good approach for dealing with helicopter parents is to ban cellphones from your dance studios. You can even ban them from the building. This will keep parents from sneaking in to snap photos or videos. OC Family explained that when kids think they’re on camera, it adds even more pressure and makes them nervous. So keep the phones out of the studio! Banning them from the building will minimize distractions in the texting and phone calls in the waiting room and hopefully encourage parents to get to know one another. Some studios use one-way mirrors or closed-circuit video feeds to allow parents to watch, without disturbing the dancers inside. Sometimes, however, even knowing that people are outside watching can affect a dancer’s mindset as they learn. If this is the case for your students, and all else fails (or if you are dealing with a “lawnmower parent“), get creative with your studio policies. One idea for dealing with helicopter parents who tend to peek into the classroom is to designate one class per week where parents are allowed to watch. Set aside the last 15 or 20 minutes of class and have your dancers showcase what they’ve learned for the parents. For novice dancers, this is a great way to get comfortable performing in front of a crowd. Outside of the set class, remain firm on your no-parents rule. That means no standing in the doorway and no peeking through the glass. Enforce your rules and make sure your instructors do too. Whether your students are toddlers or pre-teens, you’re sure to have a few conflicts during the year. Dancers who are upset or angry can interrupt the flow and atmosphere of class, so developing strong conflict-management skills is a crucial part of being a studio owner. Implement the following policies in your studio to improve conflict resolution for students and get everyone back to doing what they love. Make it a studio policy that students talk to each other about problems. Responsive Classroom explained that student-to-student conflict resolution will help children learn how to deal with disagreements in a positive manner and prevent conflict in the future. These skills are extremely valuable, especially for young dancers, and they’ll carry the lesson with them throughout life. To resolve a conflict, bring the two or three parties into your office for a low-key conversation. Before anyone talks, have the students take a few deep breaths and do a few of their favorite stretches. This will help everyone cool down and prepare them to talk calmly. Let each student say what is bothering him or her, and make sure the other students listen without interrupting (gee, does this sound a lot like parental conflict management or what?). Then work together to brainstorm a solution to the conflict and discuss how the issue can be avoided in the future. If you find that student conflicts are a common occurrence, it might be time to plan a lesson for the whole class. You may think to yourself, “Do I really need to be lecturing kids about problem solving? I’m supposed to be teaching them to dance.” However, if you have professional dance experience, you know that squabbles between dancers persist throughout all skill levels and can cause big problems. If your dancers are serious about pursuing their dreams, interpersonal skills will be imperative to their success. Discovery Education recommended that you discuss different kinds of hurtful behavior with your class and then work together to develop coping strategies. Set aside 15 or 20 minutes of class time to run this activity. Have your students share a time when their feelings were hurt, either in the studio or in school. If they’re not comfortable sharing out loud, have them write on index cards. Then, work as a class to develop methods for dealing with name-calling, gossip, exclusion and any other problems that come up. You can display these coping strategies on a poster in your studio or have students sign a contract saying they’ll stick to the policies.